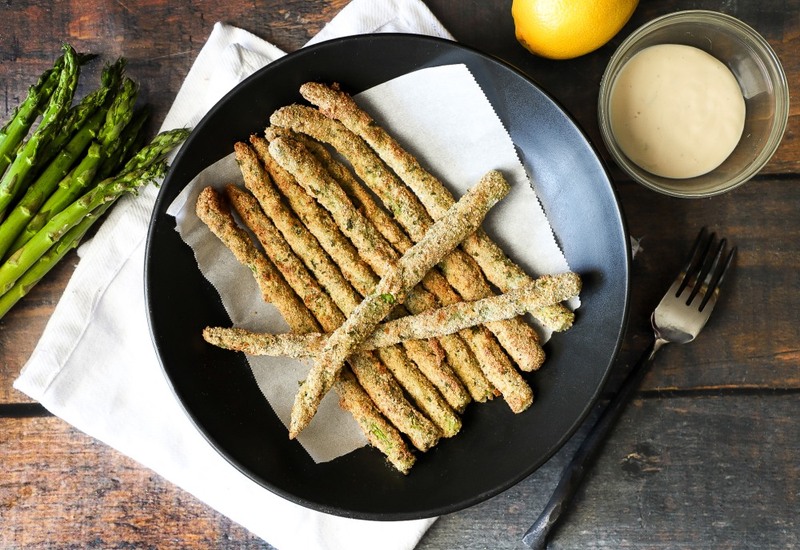 Move over French fries, because asparagus fries are here! Asparagus spears are lightly coated in seasoned bread crumbs and cooked in the air fryer, producing a tasty vegetarian appetizer that everyone will love. Dip these asparagus fries in your favorite dipping sauce like a garlic aioli or homemade honey mustard. Make these asparagus gluten-free by substituting almond flour or gluten-free flour for bread crumbs and all-purpose flour. Asparagus of medium thickness work best for this recipe. The really skinny asparagus are more difficult to coat and burn more easily and the super thick asparagus wouldn't get cooked enough in the middle. Per Serving: 225 calories; 4g fat; 36.3g carbohydrates; 11g protein; 93mg cholesterol; 382mg sodium. So yummy! I used regular bread crumbs instead of Italian and added a little nutritional yeast flakes. The asparagus wasn't overcooked, it still had a nice little bite to it. This are also a great alternative to zucchini fries. Love that they are not drenched in oil and deep-fried.